An international team of astronomers using the Utrecht Echelle Spectrograph on the William Herschel Telescope has identified the bright star Rho Cassiopeiae as the best candidate to undergo a supernova explosion in the near future. The results of this investigation are to be published in a research paper in The Astrophysical Journal on February 1. Rho Cassiopeiae is one of the brightest yellow "hypergiant" stars in the Milky Way. In spite of being 10,000 light-years away from the Earth, this star is visible to the naked eye as it is over half a million times more luminous than the Sun. Yellow hypergiants are rare objects; there are only 7 of them known in our Galaxy. They are very luminous and have surface temperatures between 3,500 and 7,000 degrees. It is believed that these stars are at a very evolved stage of their life and will ultimately explode as supernovae. Yellow hypergiants are peculiar stars because they display an uncommon combination of brightness and temperature, which places them in a so-called Yellow Evolutionary Void. When approaching the Void these stars may show signs of peculiar instability. Theoretically, they cannot cross the Void unless they have lost sufficient mass. During this process these stars end up in a supernova explosion: their ultimate and violent fate. The process of approaching the Void however, has not yet been studied observationally in sufficient detail as these events are very rare. The highly efficient Utrecht Echelle Spectrograph has allowed astronomers to monitor Rho Cassiopeiae in detail from 1993 to 2002. 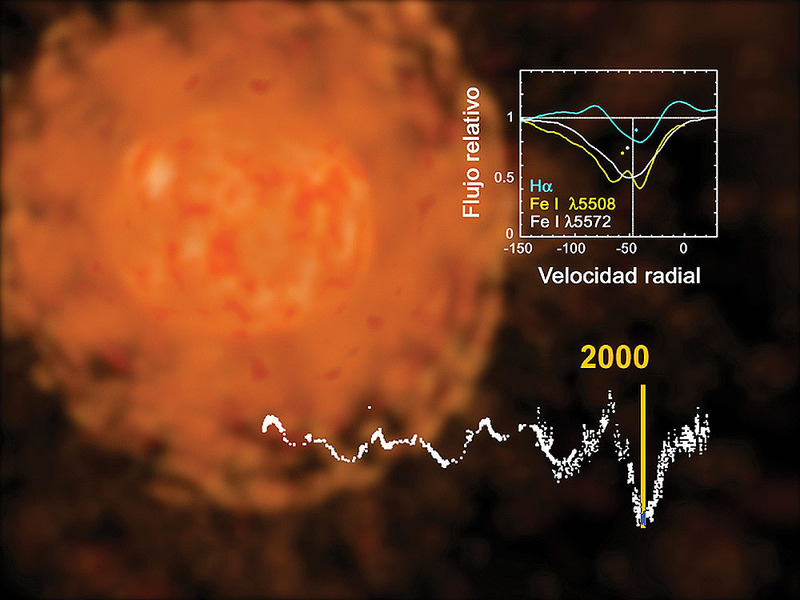 The observations were aimed at investigating the processes occurring when yellow hypergiants approach and bounce against the Yellow Evolutionary Void, and the results revealed almost regular variations of temperature within a few hundred degrees. However, what happened with Rho Cassiopeiae during the summer of 2000 went beyond anybody's expectations. The star suddenly cooled down from 7,000 to 4,000 degrees within a few months. Astronomers discovered molecular absorption bands of titanium-oxide (TiO) formed in the slowly expanding atmosphere, suggesting that they had witnessed the formation of a cool and extended shell which was detached from the star by a shock wave carrying a mass equal to 10% of our Sun or 10,000 times the mass of the Earth. This is the highest amount of ejected material astronomers have ever witnessed in a single stellar eruption. The outburst was similar to the shock wave a jet aircraft produces, which can be heard as a sonic boom. Gas rushed outwards at four times the speed of sound. Dr. Garik Israelian, one of the members of the discovery team, said: "Rho Cassiopeiae could end up in a supernova explosion at any time as it has almost consumed the nuclear fuel at its core. It is perhaps the best candidate for a supernova in our Galaxy and the monitoring of this and other unstable evolved stars may help us to shed some light on the very complicated evolutionary episodes that precede supernova explosions." Rho Cassiopeiae experienced periods of excessive mass loss in 1893 and around 1945, that appeared to be associated with a decrease in effective temperature and the formation of a dense envelope. The results suggest that Rho Cassiopeiae goes through these events every 50 years approximately. Since the event in the year 2000, Rho Cassiopeiae's atmosphere has been pulsating in a strange manner. Its outer layer now seems to be collapsing again, an event that looks similar to one that preceded the last outburst. The researchers think another eruption, possibly a stronger one, is imminent. Dr. Israelian comments: "Given the large distance it is possible that Rho Cassiopeiae has already exploded and become a black hole or a neutron star. In 10,000 years the star will undergo 200 outbursts (if the frequency is 50 years). In each event it will lose 0.1 times the mass of the Sun and therefore 20 solar masses will be lost in 10,000 years! Very likely Rho Cassiopeiae does not exist any more." The science team involved in this research consists of Drs. Alex Lobel, Andrea Dupree, Robert Stefanik and Guillermo Torres (CfA, USA), Garik Israelian (Instituto de Astrofísica de Canarias, Spain), Nancy Morrison (University of Toledo, USA), Cornelis de Jager and Hans Nieuwenhuijzen (SRON, The Netherlands), Ilya Ilyin (University of Oulu, Finland) and Faig Musaev (SAO, Russia). The Utrecht Echelle Spectrograph (UES) was designed and built by the Astronomical Institute at the University of Utrecht, The Netherlands, under a contract placed by the Royal Greenwich Observatory and the Netherlands Foundation for Radio Astronomy. The acquisition and guidance unit was constructed at the Kapteyn Institute at Roden, The Netherlands. 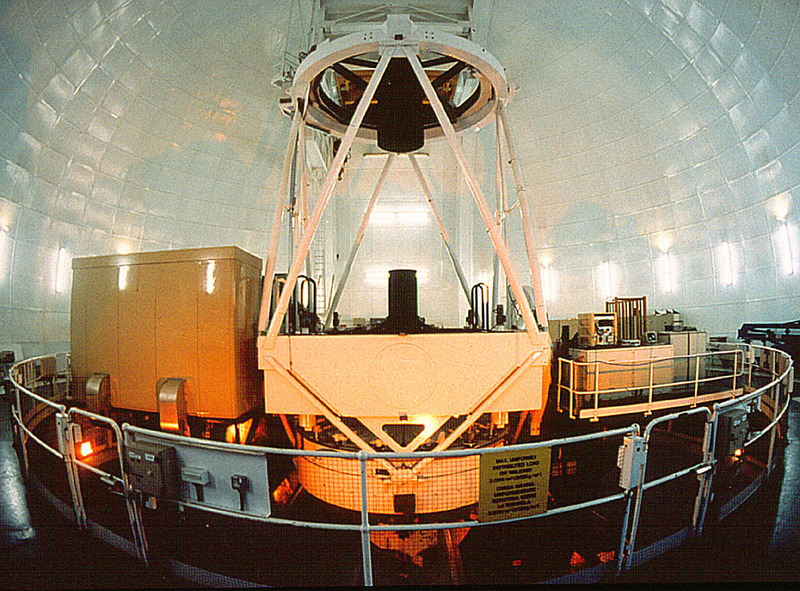 First light on UES took place in 1991 and until recently it was mounted at one of the Nasmyth foci of the William Herschel Telescope. The Isaac Newton Group of Telescopes (ING) is an establishment of the Particle Physics and Astronomy Research Council (PPARC) of the United Kingdom, the Nederlandse Organisatie voor Wetenschappelijk Onderzoek (NWO) of the Netherlands and the Instituto de Astrofísica de Canarias (IAC) in Spain. The ING operates the 4.2 metre William Herschel Telescope, the 2.5 metre Isaac Newton Telescope, and the 1.0 metre Jacobus Kapteyn Telescope. 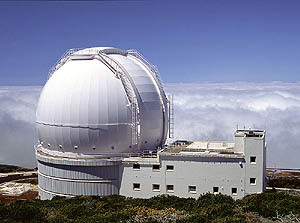 The telescopes are located in the Spanish Roque de Los Muchachos Observatory on La Palma which is operated by the Instituto de Astrofísica de Canarias (IAC). 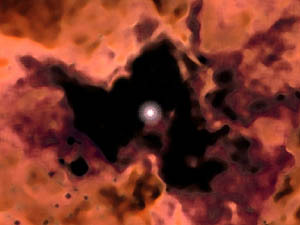 Caption: Artist's impression of Rho Cassiopeiae at the 2000 outburst. Upper right: Spectral line profiles. Bottom right: Light curve. 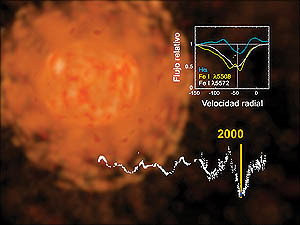 Picture credit: Gabriel Pérez Díaz and the Instituto de Astrofísica de Canarias. Caption: Artist's impression of Rho Cassiopeiae's recent evolution. Caption: William Herschel Telescope. The Utrecht Echelle Spectrograph can be seen at the Nasmyth focal station of the telescope (right). 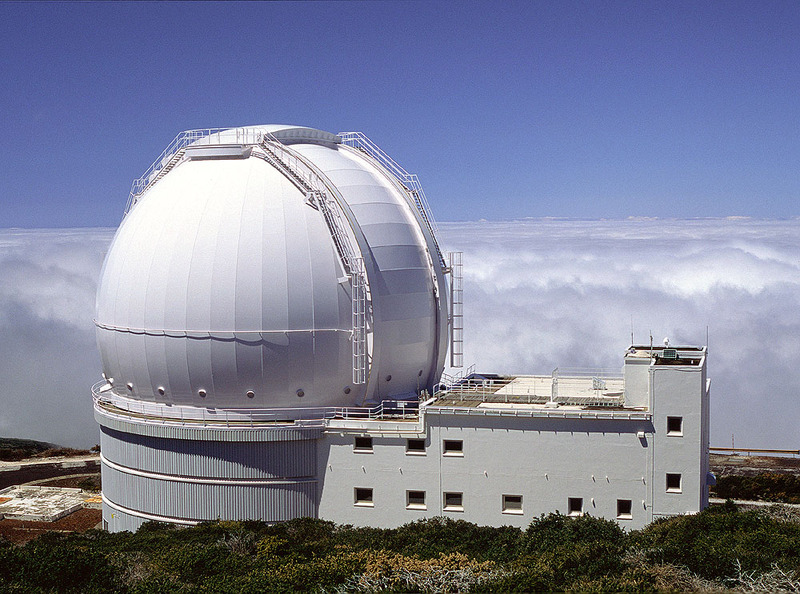 Caption: The William Herschel Telescope, the most powerful optical/infrared telescope in Europe. More information on the William Herschel Telescope: Public Information on the WHT. Echelle spectrograph. A spectrograph is an instrument for obtaining a record of the component colours, or wavelengths of light from stars. The most familiar example of a spectrum is the natural rainbow, which occurs when sunlight is dispersed into its component colours by the combined prism-like action of raindrops. An echelle spectrograph employs a carefully designed combination of optical components (gratings, prisms, mirrors and lenses) to separate the light in many different wavelengths at high resolution while at the same time ensuring that a large portion of the starlight can still be detected. Light-year. The distance travelled through a vacuum by light in one year. A light year is equivalent to 9.4607×1012 kilometres.